There can be no doubt now as to whether Manchester United ‘s malaise has turned into a full-blown crisis. Monday’s 3-0 home loss to a Tottenham Hotspur side that normally find it so hard to express themselves at Old Trafford dumps United into a pit that they look ill-prepared to dig themselves out of. With their various issues having been played out in public over the last couple of months, their fortunes on the field are in every respect mirroring their issues behind the scenes. Last week’s defeat at Brighton showcased a lack of heart, direction and courage, and while against Spurs they had more of each, they were outclassed when it was necessary in an abysmal second-half showing. Jose Mourinho’s selection of Ander Herrera as a centre-back smacked of an act of desperation, maybe even an attempt to prove a point to his superiors. But while the Spaniard battled away well in the unfamiliar role, it was a move which would come back to bite the manager. His decision to boldly change to a completely new back three of Herrera, Chris Smalling and Phil Jones and make a total of six changes had Spurs startled to begin with but there was little sign that United were actually going to make the most of their early running. Romelu Lukaku’s inability to make the most of Danny Rose’s short backpass in the first half loomed large over the match, and by the time half-time was approaching it was Spurs making all the headway. The visitors should have had a penalty during that spell after Phil Jones’ clumsy challenge caught Lucas Moura’s leg and brought down the Brazilian, but referee Craig Pawson waved away Spurs’ claims. There would be no saving United’s bacon after the break though. Harry Kane opened the floodgates with his first-ever Old Trafford goal when he easily lost Phil Jones to power home a header from Kieran Trippier’s right-wing corner, then within 133 seconds Lucas pounced after Herrera dropped five yards deeper than Smalling and played the Brazilian onside as Christian Eriksen roamed free on the right. It could have got worse, with substitute Victor Lindelof handing the ball on a plate to Dele Alli only for the England attacker to waste the chance. United’s awful play in their own half was unbecoming of any top-level side and only served to underline Mourinho’s concerns over the ability of his current squad to protect David de Gea in a title challenge. For too much of the game United looked utterly rudderless. The manner of their second-half performance was in many reminiscent of their Champions League exit to Sevilla last season. A quick counter-punch amid a period of utter chaos. The third goal always looked likely to come on the break late on and Smalling’s bumbling attempt to stop Lucas on the break was symptomatic of their evening. The sight of the net rippling for a third time led to a mass exodus in the stands. Ed Woodward has told the world that he doesn’t trust his manager with any more of his money, Mourinho himself has made it be known he does not have the requisite faith in his defence to do the job for him. Paul Pogba has said there are issues he cannot talk about for fear of being fined, while Anthony Martial has become more a pawn in a political game being played out by Woodward and Mourinho than an attacker of high quality. All the while, United have now lost two of their opening three league fixtures for the first time since 1992-93. They went on to win the Premier League that season under Sir Alex Ferguson but the club is in a very different state right now and there are very few Eric Cantonas going cheap on the market these days. 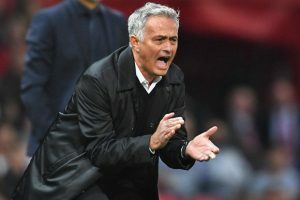 With the club’s main figures on the verge of all-out warfare and their team looking completely devoid of confidence or ideas, things need to come to a head sooner rather than later at Manchester United. The club is in a self-made crisis, and the sooner they do something about it one way or another the better.